caramel apple cake | omfg. so good. My kids are little tiny walking petri dishes. Seriously, I (like so many other parents I know) dread this season. The past week has been filled with trips to-and-from the doctor’s office, followed by trips to-and-from the pharmacy, followed by gentle headlocks and bribery to get them to swallow the much needed germ killing medicines. 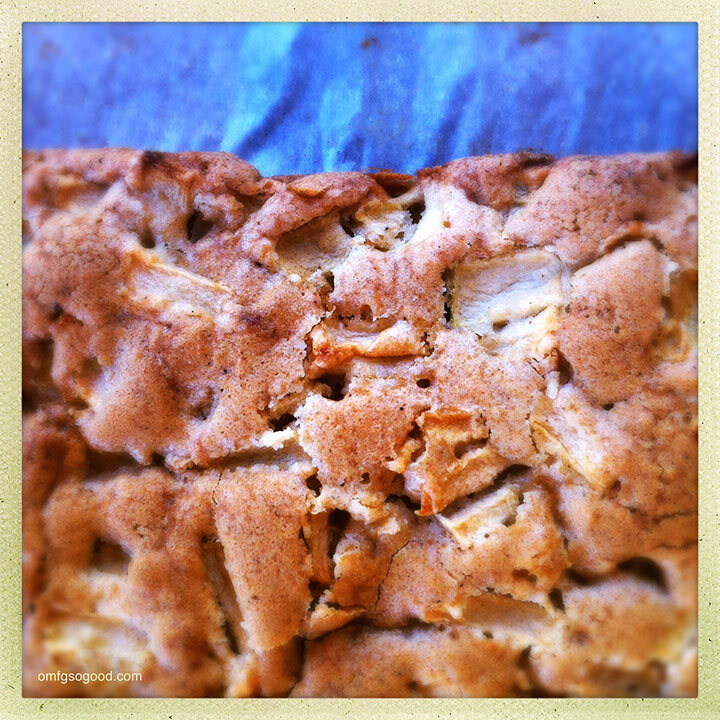 Before any of that happened, I made this amazingly moist cake with fresh tart Granny Smith apples. Perfectly spiced it with a combination of cinnamon, nutmeg and ground cloves, then topped it all off with homemade warm, buttery caramel sauce. Wow. If I think about this cake hard enough, it’s almost like the whole germfest never occurred. But alas, it did. And now, inevitably, I have bronchitis. So this post is going to be short and sweet. Because Mommy needs tea and sleep. Preheat the oven to 350 degrees. Line a 9 x 13″ cake pan with parchment paper leaving extra on the sides to lift the cake out after baking (or grease and flour if you prefer) and set aside. In a large mixing bowl, sift together flour, baking powder, nutmeg, cinnamon, cloves, baking soda and salt. In a separate large mixing bowl, cream together the butter and both sugars until thoroughly combined. Add the eggs, one at a time, and mix to combine. Add the dry ingredients in batches, mixing to combine between each batch. Add the chopped apples and stir with a wooden spoon until just combined. (The batter will be super thick. Don’t worry.) Spoon the batter evenly into the prepared pan. Bake in the preheated oven for 50 – 55 minutes. Cool in the pan on a wire rack for 45 minutes before serving. While the cake is cooling, make the caramel sauce by combining the butter, both sugars and the heavy cream in a heavy saucepan over medium-high heat. Stirring constantly, bring the mixture to a low boil, remove from the heat and add the vanilla and a small pinch of salt. Whisk to combine then transfer to a glass or ceramic bowl. 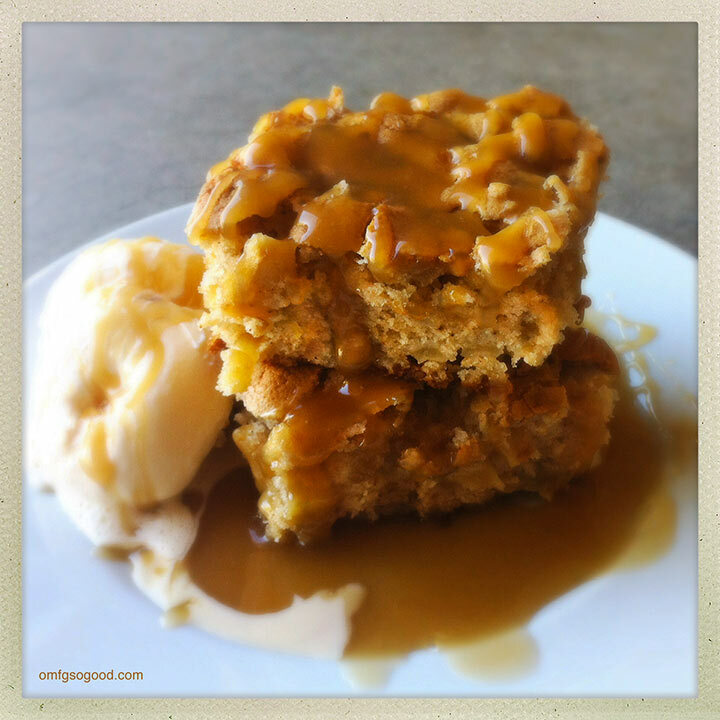 To serve, cut the cake into squares and spoon a good portion of the warm caramel over the top. Sidecar with a few scoops of vanilla bean (or dulce de leche… how scandalous) ice cream. Um, yup. One bite, and all your cares just float right out the window. Too bad all the little kid germs can’t float away with them. Night-night, chums! It really looks fantastic, I can taste the cake just thinking about it!! Will just have to try this recipe!! !